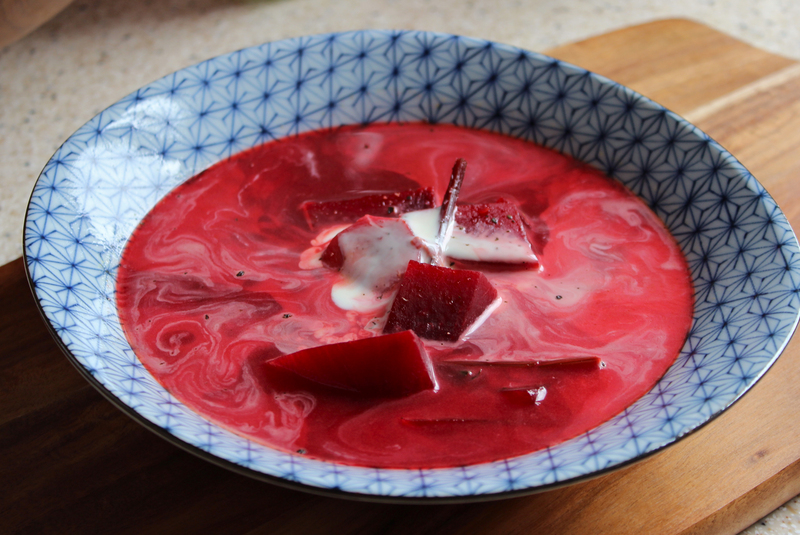 Beetroot soup always reminds me of my childhood, holidays at my grandparents’ in Poland and family Christmases. Barszcz was part of the Polish Christmas dinner at my house, but served with homemade mushroom ravioli that floated around the pink broth like little dumplings. Beetroot is a deliciously sweet vegetable, and with the cream and lemon juice in this recipe it becomes tangy and creamy too. This is my family’s recipe, but it is very loosely adhered to – you can add some potato, green beans or beetroot stalks to bulk it out, and serve it pureed and smooth or as a chunky broth. It is very much an everyday soup and will only take half an hour to make and set you back around 80p if you use cooked pre-packaged beetroots and already have vegetable broth on hand. Serves 4, approximately 21p per serving. Put the vegetable broth on the hob (medium heat) in a large pan and add the sliced beetroots and carrots. If you’re using pre-cooked beetroot, allow the carrots to cook for 5-10 minutes before adding the beetroot. Simmer gently for about 20 minutes until the vegetables are soft – at this stage you can puree the soup with a hand mixer if you like. Alternatively, you can add one potato or 100g green beans 5 minutes after you add the other veg.